The maps I posted the last two days were preliminary to this post. I would like to see two significant changes to the streets in downtown/midtown Sacramento that will make these areas more livable, more walkable, more bikeable, and safer. I am proposing the complete elimination of traffic sewers from downtown/midtown Sacramento. What is a traffic sewer? It is a street designed to move large volumes of vehicles at high speed in and out of work areas during morning and afternoon commute times. In Sacramento, the main work area is the state buildings downtown, though there are certainly other employers and other areas, including midtown. 1. 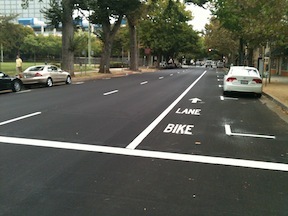 Convert all three-lane streets into two-lane streets. The map showing these streets in the downtown/midtown area is linked from my Sac 3-lane Streets post. These three-lane streets are, of course, also one-way streets. In many cases the lane removed would be used to provide bike lanes or protected bikeways, but in some cases the space might be best used to create wider sidewalks or diagonal parking where additional parking is needed. Though in some cities the three-lane to two-lane conversion is used to create a turning lane, I don’t believe that these are necessary in downtown/midtown, nor do I feel that this is a good investment of right-of-way.